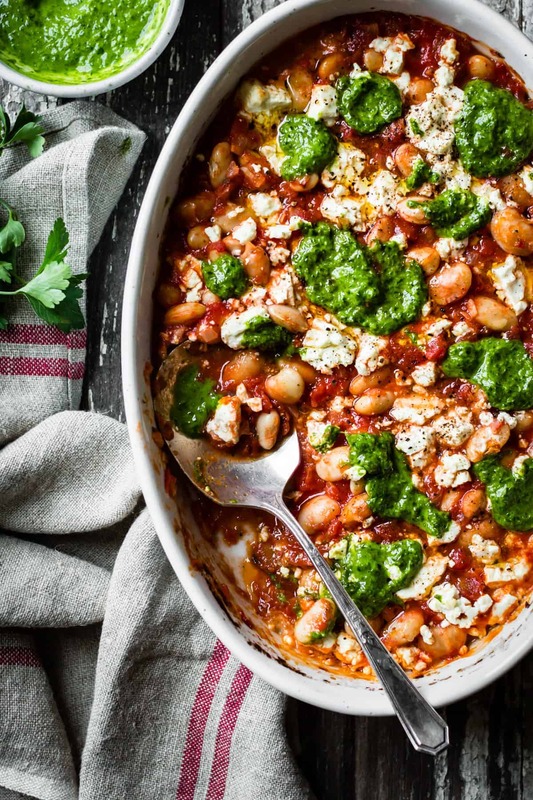 Creamy white beans baked in a rich tomato sauce with loads of feta and emerald green parsley oil are a twist on the Greek dish Gigantes Plaki, inspired by Kokkari Estiatorio in San Francisco. A few of weeks ago, I met Emma at Kokkari Estiatorio, a Greek restaurant in San Francisco’s Financial District. Though new to me, it was clear the moment I walked in that Kokkari is a seasoned SF establishment. I felt instantly cozy as I took a seat at the long bar, not just from the large stone fireplace and crackling fire, or the weathered wood table laden with huge loaves of freshly baked bread, or even from the glass of dry red wine handed to me by the cheery bartender; even at 5:30 on a Monday afternoon, the place was packed with friends, families, and couples all of who seemed to feel as lucky as I did to be out of the cold and anticipating a good meal. 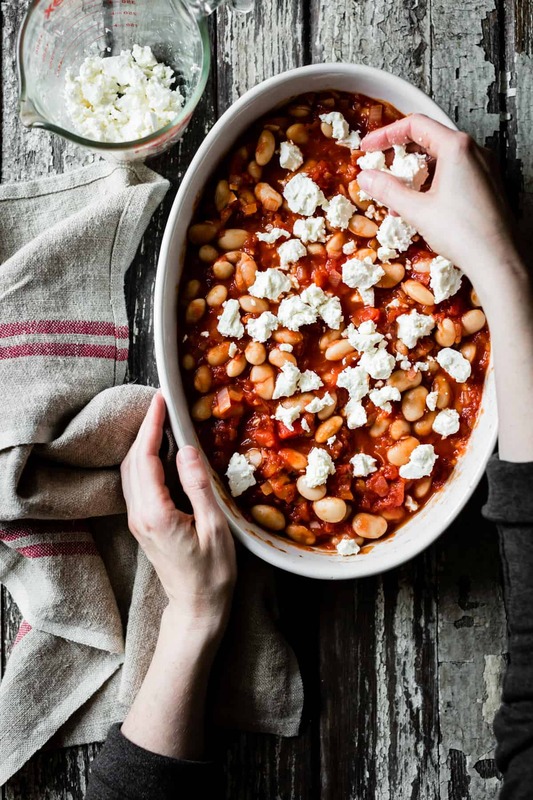 Emma and I had both ogled the oven-baked giant beans with tomato sauce, olive oil & herbed feta from the online menu, and Emma had ordered some. They waited for me in an individual cast iron skillet, warm and bubbly and slathered in olive oil. 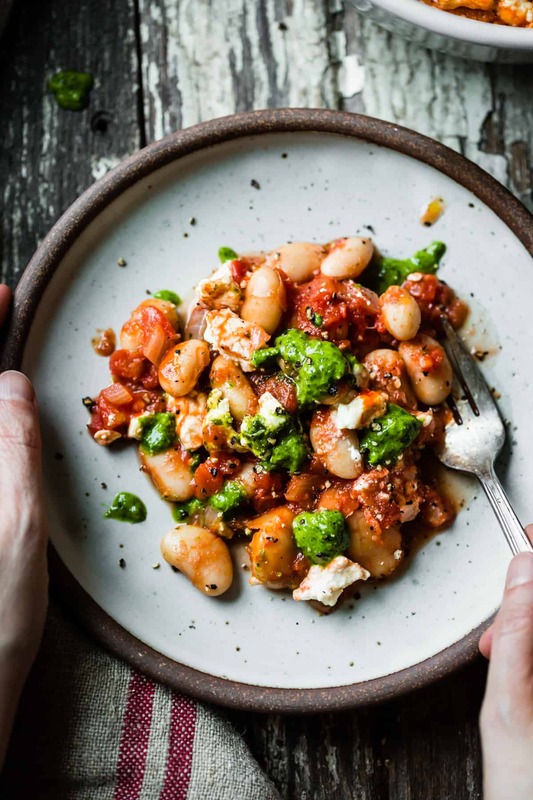 The beans themselves were tender and creamy, the tomatoes were thick and sweet and peppered with nubs of tangy feta. 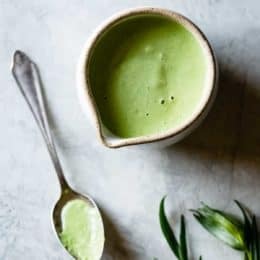 There was something green on top that cut through the richness – parsley pureed with olive oil, I thought. We downed the beans as we discussed boys, photography, and food. There was tomato and cucumber salad bathed in olive oil and oregano, a slab of kefalograviera saganaki (fried cheese! ), and for dessert, a slice of the lightest, creamiest flourless chocolate cake we’d ever had, and a scoop of tart frozen yogurt with the texture of gelato. On our way out the door, we spied a cook brewing coffee in small pots set in a bed of hot sand. We annoyed the bustling staff by standing there, mesmerized, watching him scoop coffee grounds, water, and sweetener into the pots, nestling them in the sand under which a fire burned, and 30 seconds later, the coffee bubbled up. He poured us each a cup and it tasted like hot cocoa – thick, rich, and slightly sweet. The beans stayed in my mind the rest of the night (caffeine high! ); I needed to eat them again, ASAP. They reminded me of this cozy gratin that Amanda shared recently, so using that as a guide, I whipped up this dish the following weekend. 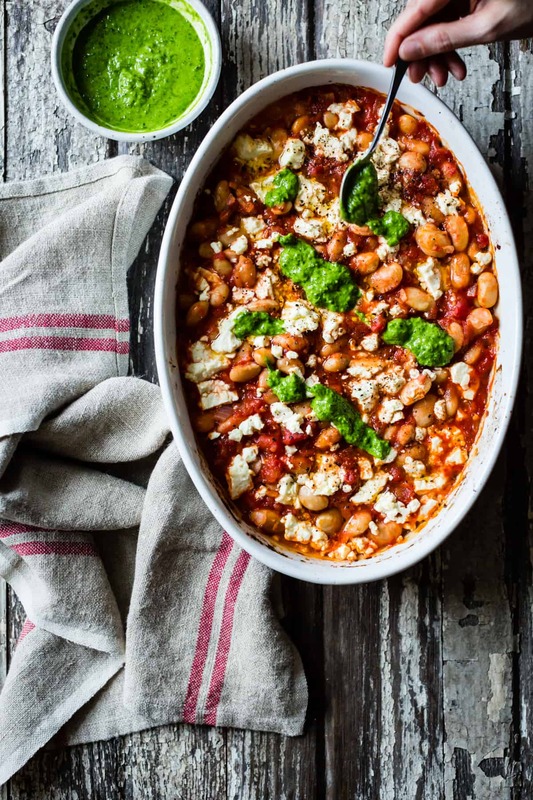 You might think that beans would make for rather a stark dinner, but this is not the case when they’re baked in rich tomato sauce surrounded by loads of cheese. The dish manages to feel nourishing, healthy, and decadent all in one go, almost like a baked pasta dish without the pasta. The lemony parsley oil isn’t traditional, but it’s what makes this dish pop, hooking me into another bite, and another. A bit of crusty bread or toast (I’m currently loving Grindstone Bakery’s gluten-free sourdough flecked with flax seeds) is handy for pushing the sauce around. Finish it off with a little salad (we’ve been making a version of this kale salad) and a glass of red wine, and you’ve got yourself a tasty meal. Or spoon the beans over crostini for a perfect little appetizer. This twist on the Greek dish Gigantes Plaki makes a tasty appetizer or cozy vegetarian meal. A bit of bread is nice to push the sauce around. If you need Plaki right away, feel free to make this with beans from a jar or can; you'll need 2 1/2 cups drained beans. Otherwise, begin soaking your beans the night before you plan to make this. The beans, sauce, and parsley oil can all be made up to several days ahead if you like. 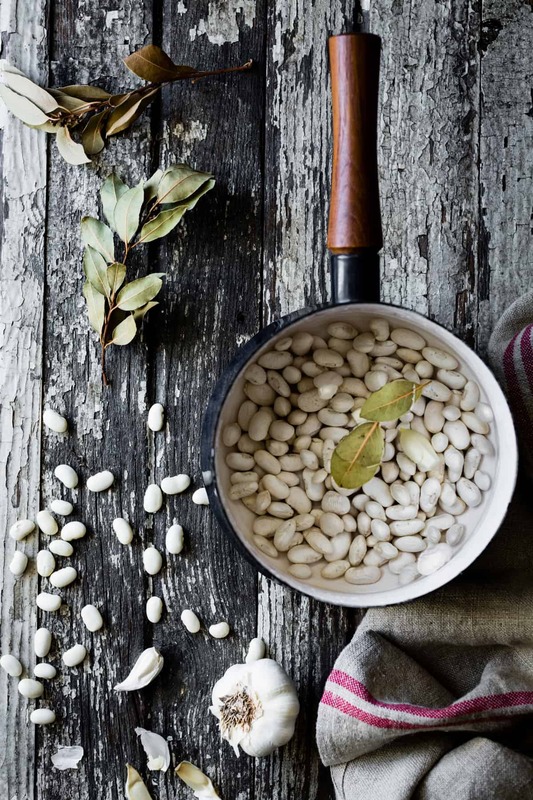 Place the soaked, drained beans in a large saucepan and cover with 4 inches of water. Add the bay leaf and garlic, and bring to a boil over high heat. 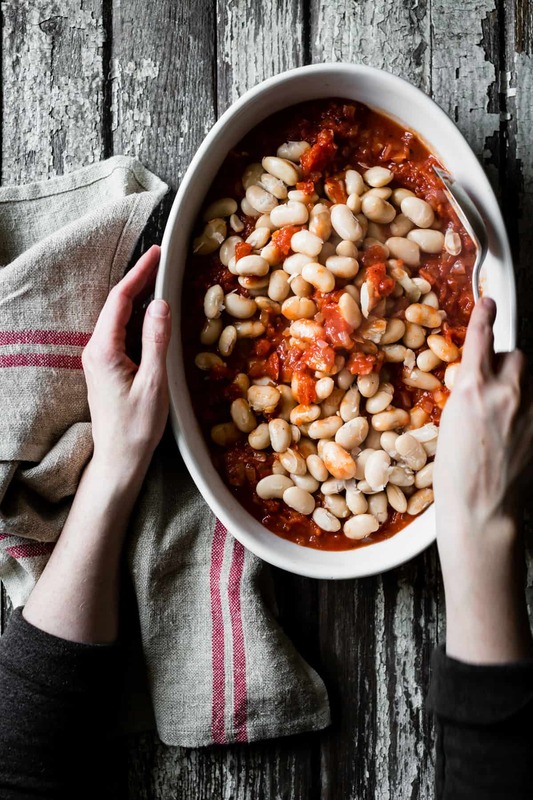 Reduce the heat to medium to maintain a simmer, cover the pot partially, and simmer the beans until nearly tender; this can take anywhere from 30-60 minutes depending on the size and dryness of the beans. Add the salt and continue cooking until the beans are very tender but still holding a shape. Let cool in their liquid until needed. The beans can be stored, refrigerated airtight, for up to 1 week. When ready to use, drain well and remove the bay leaf. Position a rack in the upper third of the oven and preheat to 400ºF. Have a ceramic or glass baking vessel at the ready; I use an oval gratin dish measuring 9x13 inches; a 10-inch round pan or 9-inch square would work, or anything equivalent. In a wide, non-reactive skillet (steel or enamel so as not to affect the flavor of the tomatoes), heat the olive oil over medium heat. Add the onion and garlic and cook, stirring frequently, until tender, 10 minutes. Add the tomatoes and their juices, oregano, salt, and pepper. Bring to a simmer, then lower the heat and simmer, stirring occasionally, until thick and saucy, 10 minutes. Scrape the sauce into the pan and add the drained beans, tossing them to coat. Dot with the feta, pressing it into the sauce, and drizzle with a bit of olive oil, salt, and pepper. Bake the beans until bubbling and beginning to brown on top, 25-35 minutes. While the beans bake, place the parsley, lemon zest and juice, olive oil, and salt in a blender or small food processor. Puree smooth. The parsley oil can be kept refrigerated airtight for up to several days. When the beans are baked, drizzle with some of the parsley oil and serve. Leftovers reheat well in a 350ºF oven for 10 or so minutes. I love greek food, and will try your version of fasolada when I can. 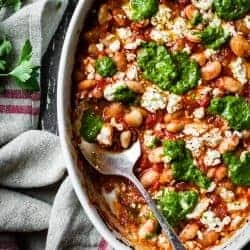 I love white beans and this is such a gorgeous dish! Love those dollops of vibrant parsley oil! What a fabulously complex yet simple recipe.. the flavors, colors, textures…. oh my! I can just imagine you two at that bar chattin up food and photog. I admire both of your work so. This will be happening! Looks amazing! 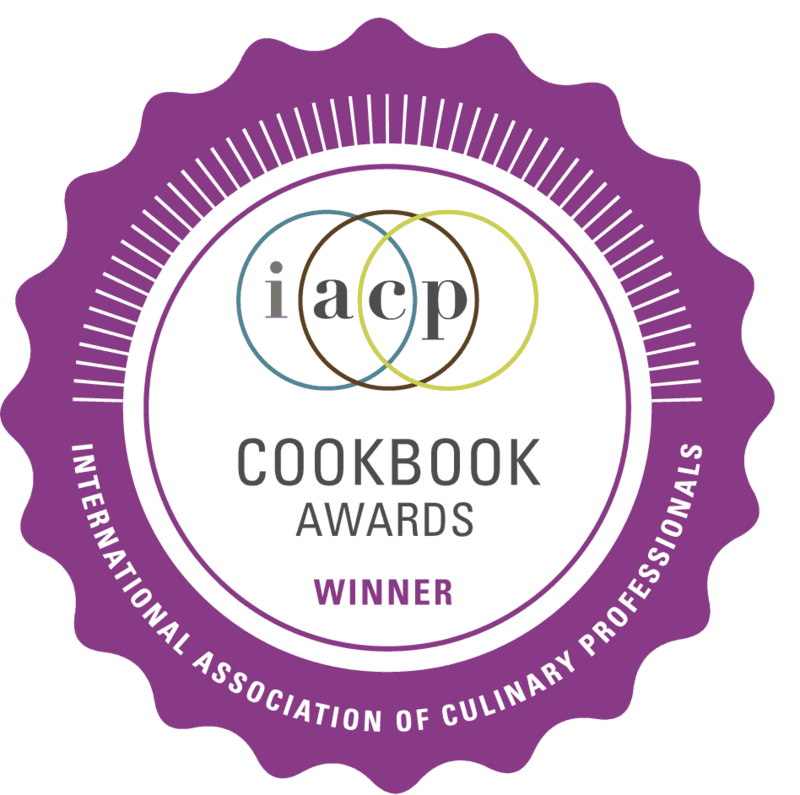 Can you please make a savoury cookbook now? AHHHH! I CANNOT WAIT TO MAKE THIS! It reminds me of a dish at Nopa — which is baked giant beans and feta — but the parsley oil — the parsley oil!!! And the tomatoes! This restaurant sounds amazing — dare I dream that they are making something resembling Turkish coffee there?? 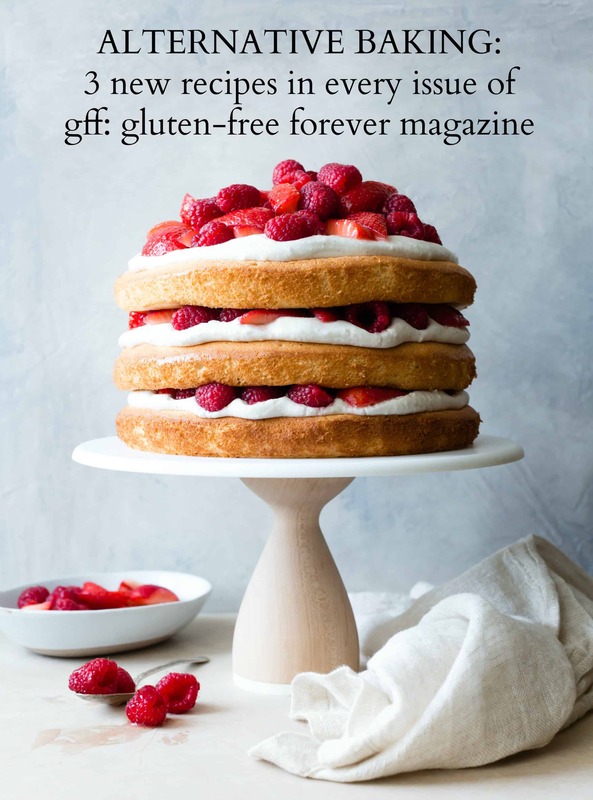 Thank you for sharing the location of your inspiration and I can’t wait to try this recipe! 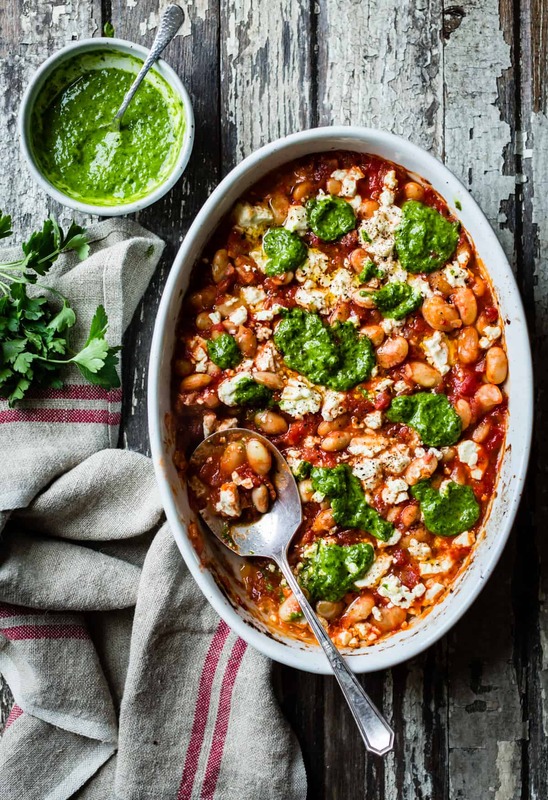 Made this today with some adaptations…had two layers, one of spinach with cream and nutmeg, then tomato oregano sauce over it with broad beans and feta. The oil was like how you said but I didn’t have parsley so substituted garden grown mint and basil….my daughter said it’s one of the best things I ever made! Thank you! Btw, served it with homemade chipotle onion rolls…. SO vibrant and beautiful, Alanna! And that dish looks stunning. 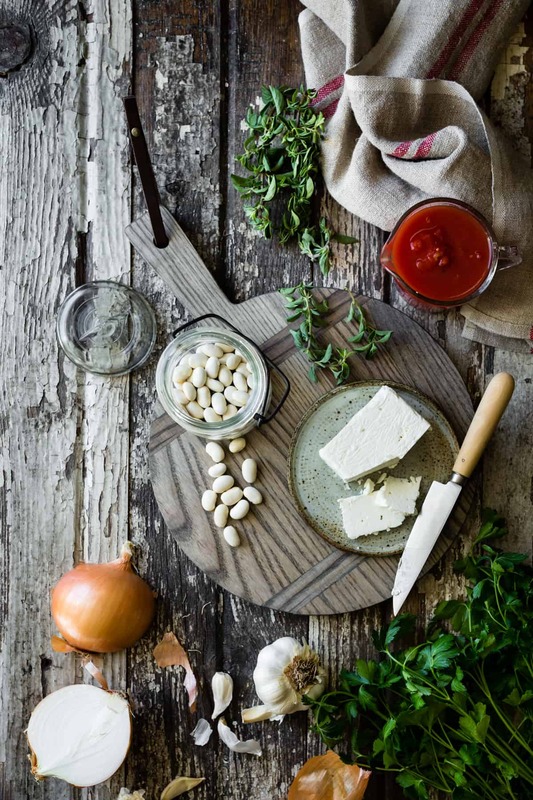 I love feta and that parsley oil … YUM! Such a gorgeous dish, it looks so pretty! I love all the flavors going on here and this on a bread to make a crostini! Genius! Gorgeous shots as always Alanna! Kokkari is on my list and I hope I can go there this year! :) It sounds wonderful! I want to eat every single thing that you just described, but especially these beans. OMG. Made this, and it’s killer. 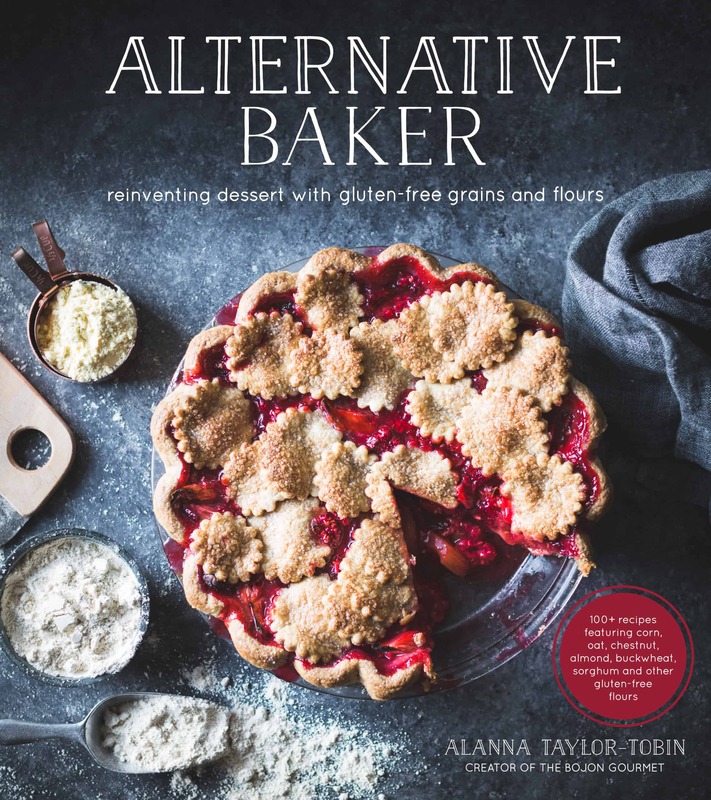 This is going into my rotation of off the cuff recipes. Aw, I’m so glad you like it! these beans look amazing! such an easy, healthy and comforting dinner. could just imagine how good it would be with a piece of buttered, crusty ciabatta… can’t wait to try. Delicious! I used Miyoko’s garlic herb cashew cheese instead of Feta, and served it as Sunday supper to my Fiancé’s parents. Major hit! The parseley lemon oil just takes it to another level! Yummy! 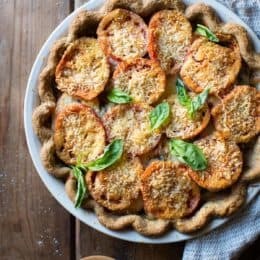 I’m making this tonight and I’m so excited! Could I substitute with black eye beans instead? That’s what I soaked last night and I’ve been hunting for recipes and saw this beauty! I don’t see why not! Let me know how it goes? 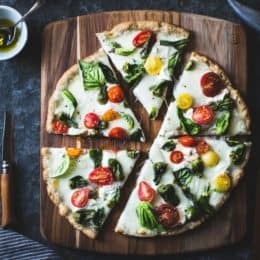 This has become one of my favorite meals… so easy, adaptable (drizzle with any pesto, use whatever fresh herbs I have, etc…) CHEAP :) and SO delicious!! I made it today with homemade garlic naan bread as my utensil of choice. Any dish that can be eaten with bread is always a winner in my book! Thank you! This sounds amazing- I’m a little confused if I soak the bean overnight and then follow the directions on the beans or if that is what I do, but you mention 30-60 mins?! But, then overnight earlier so can you please clarify? Making for ladies dinner party tomorrow! Thank you! Hi Vanessa, Sorry if I caused any confusion. If you’re using dried beans, you need to soak them overnight to make them tender enough that they’ll cook in 30-60 minutes, but soaking overnight does not actually cook them. So, after soaking overnight, you’ll still need to cook them for 30-60 minutes using the method described. If you used canned beans, you don’t need to soak them overnight or boil them for 30-60 minutes. So if you opt to use canned beans, just start with the tomato sauce as your first step. If I use canned beans, how many grams should I use?